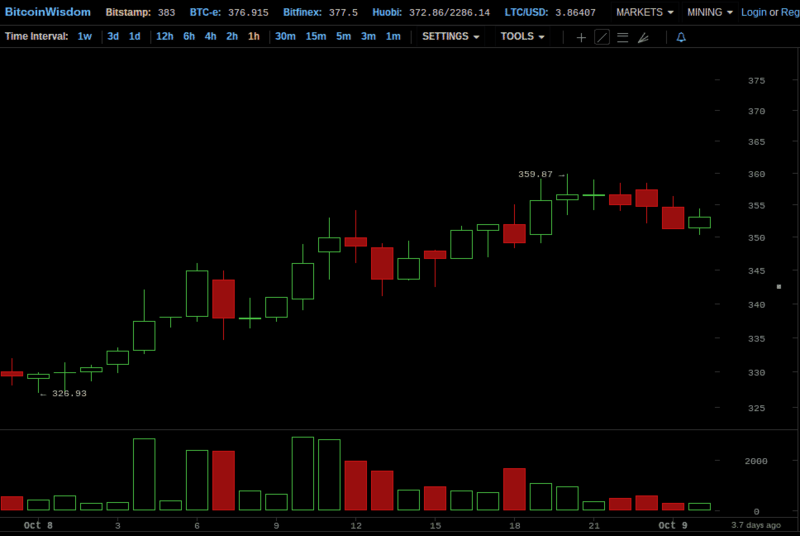 This is the Coin Brief weekly Bitcoin price report for the week of October 5-October 11, 2014. This week was very interesting in terms of Bitcoin price activity — mostly due to the infamous “BearWhale,” which captivated the Bitcoin community for several days.. Overall, throughout the duration of the week, the price increased by 8.06%. October 5 kicked the week off on a downward slope, which was a continuation of last week’s bearish Bitcoin price activity. The day opened at $335 and fell to $288 by the bottom of the noon hour, with an hourly low of $275 — marking the first time the Bitcoin price has fallen below $300 in many months. After falling below $300, the price shot back up into the $320s at 3 PM, and even reached an hourly high of approximately $335 at some point during the 7 PM hour. Then, at 10 PM, the price fell to $300 and stayed there until 3 AM the next morning. This strangely flat price activity was likely due to what many in the Bitcoin community have dubbed the “BearWhale.” The BearWhale is a person who allegedly set a sell wall at $300, and kept it at that level until buyers “ate” the wall. October 5 closed at $300. The 7th of October began at $335, up 11.67% from the start of the previous day. 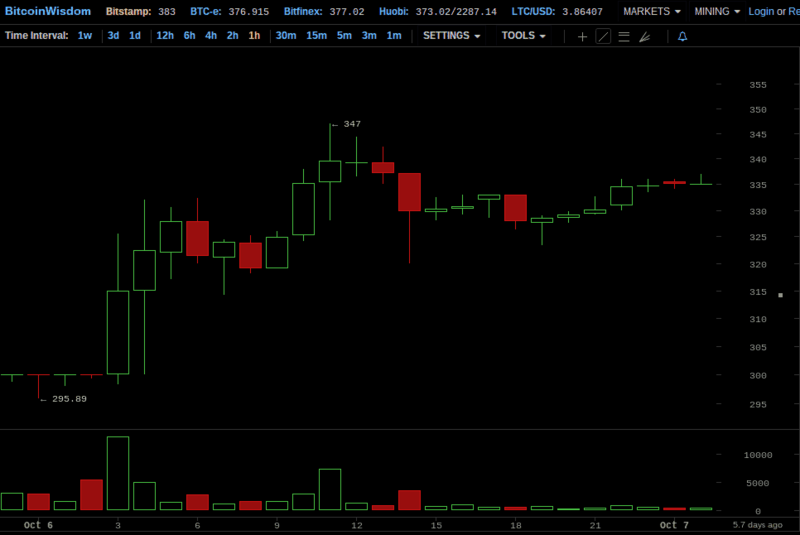 The Bitcoin price fell into the $320s in the early morning hours, but then returned to the $330s at 11 AM. 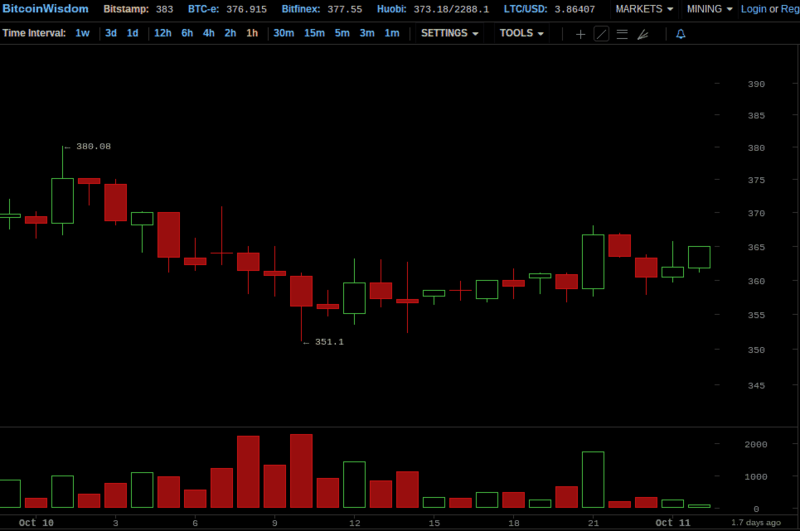 For the rest of the day, the price hovered between $329 and the low-to-mid $330s. 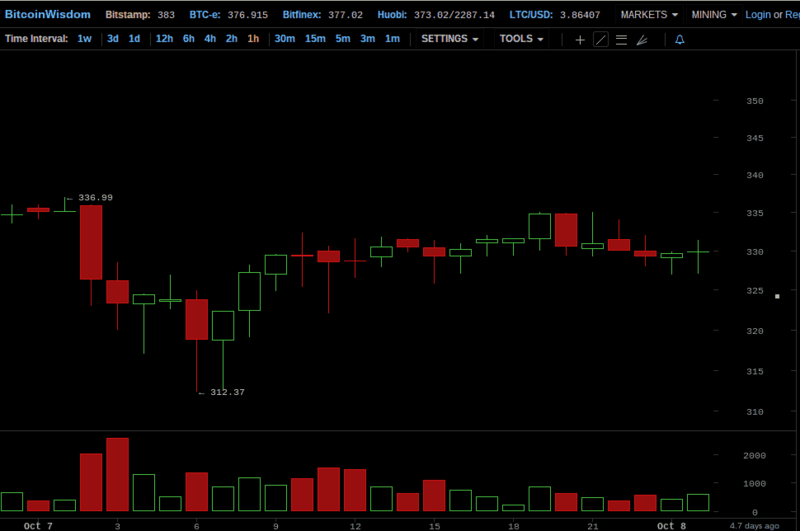 The day closed at $330. The day opened at $330, a 1.49% decrease from the beginning of the 7th. Following the end of the massive sell wall set up on the 7th, the Bitcoin price made steady gains throughout the entire day. At the top of the noon hour, the price had reached $350, a 6.06% gain from the start of the day. During the latter half of the day, the price increased only slightly, hovering between the high $340s and the high $350s. October 8 closed out with the price at $354. October 9 began at $354, a 7.27% increase from the start of the previous day. The first half of the day saw a continuation of the gains that were made yesterday; the Bitcoin price rose to $387 by the close of 10 AM, with an hourly high of $395.55. 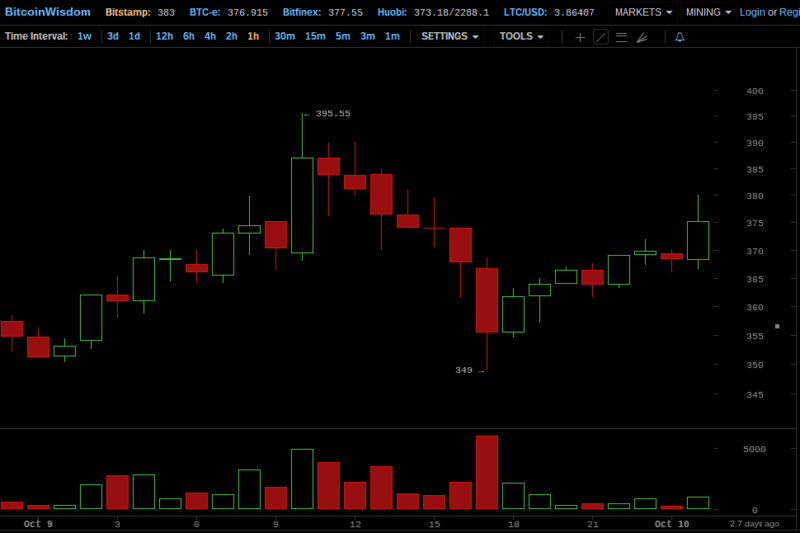 At noon, however, the price began to fall, and hit $355 by the bottom of 5 PM — with an hourly low of $349. The day ended at $369. The 10th of October started at $369 — making for a 4.24% increase from the open of October 9. 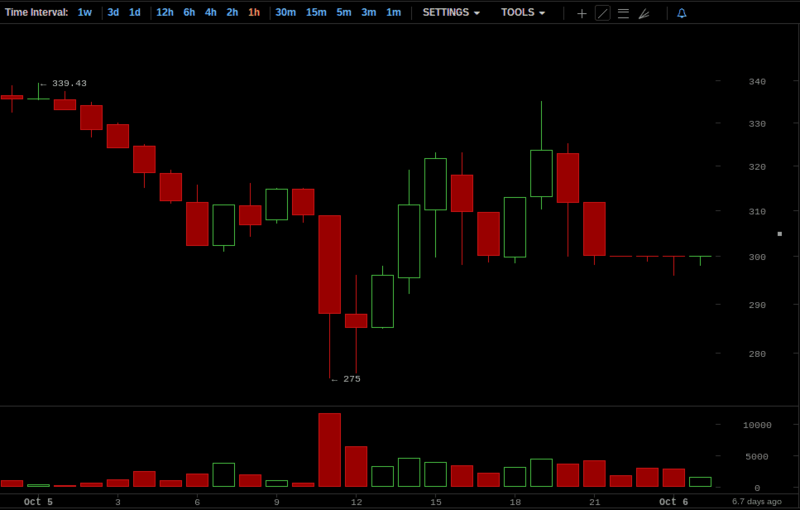 The first half of the day was spent on the decline; by the bottom of the noon hour, the Bitcoin price had hit $359. Then, in the latter half of the day, the price leveled out. 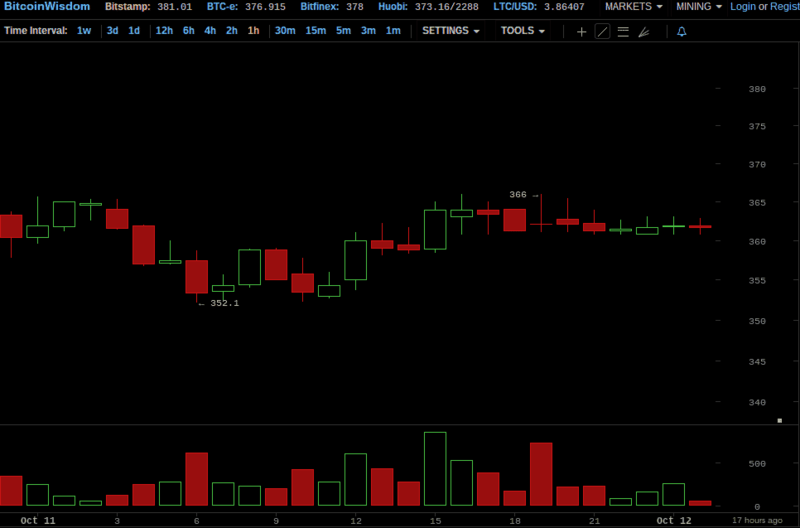 Throughout the remainder of the day, the price hovered between the upper $350s and the mid $360s. The day closed at $360. Last week, our ceteris paribus (all things remaining equal)forecast for this week’s Bitcoin price activity was far from what played out in reality, meaning that the price-determining factors changed drastically during the week. The actual price activity took the exact opposite course than the one laid out in our forecast; the week was very bullish overall, with the price increasing by a total of 8.06% during the week. This large shift in valuations was undoubtedly influenced by the “BearWhale,” which stirred up a lot of excitement in the market. Given the unusual activity of this week, we will advance two possibilities for the Bitcoin price activity of the coming week — ceteris paribus, of course. First, we will offer up a bullish forecast, and say that the price will continue rising in the post-BearWhale market, or will stay flat at the very least. Secondly, we advance that the price spike that occurred in the aftermath of the BearWhale’s sell wall is simply temporary excitement, which will correct itself in the coming days. This bearish forecast could take the form of flat price activity as well, as it may take longer than one week for the temporary excitement to work itself out of the market.